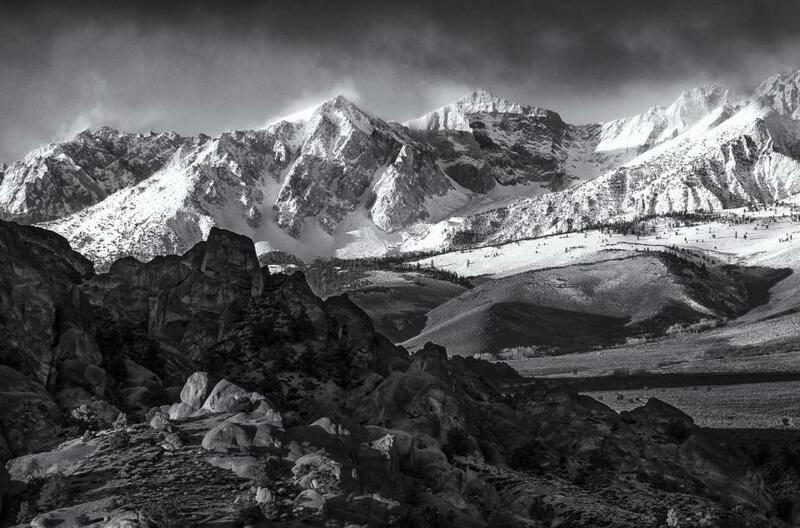 An amazing morning in the Eastern Sierra mountains. A storm was moving into the area, and the weather was changing by the minute. It would be sunny briefly, then clouds would literally descend on you. That's what happened in this shot. I was shooting the mountain range from the Buttermilk Boulders, and thinking I was finished I packed up my gear and headed out. As I turned around I saw sunlight was hitting the peaks and the hills right in front of me, and a cloud was descending rapidly-you can see it in the top of the frame. I didn't have time to set up my tripod, just pulled my camera out and took a shot. I only had time for one before the entire area was enveloped in clouds. Converting this to monochrome emphasized the light on the peaks, the layers, and the snow plumes blowing from the tops of the peaks. Converted in Nik Silver Efex. Gear: Canon 5D MkIII, 24-105 mm lens. Fantastic picture Laura. Beautiful scenery and loved the B&W conversion. Congrats!